On Sunday, November 18, 2018, Edith Carolyn Martin exchanged her rugged cross for her precious crown at the McLeod Hospice House in Florence. Born on May 31, 1937 in Manning, she was a daughter of the late James Preston & Corine Witherspoon Martin, Sr.
Service of remembrance shall take place on Tuesday, November 27, 2018, @ 11:00am from the Elizabeth Missionary Baptist Church, 4829 Alex Harvin Highway, Ram Bay Community, Manning where the Pastor, the Rev. Terry R. Johnson, shall bring words of hope. The service of committal shall follow in the family plot located in the Elizabeth Missionary Baptist Church Cemetery. The family shall receive relatives and friends Monday, November 26, 2018, from 5:00pm-8:00pm at the residence, 1051 Overlook Lane, Ram Bay Community, Manning. To send flowers or a remembrance gift to the family of Edith Carolyn Martin, please visit our Tribute Store. 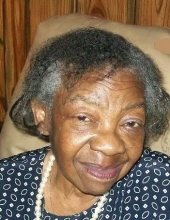 "Email Address" would like to share the life celebration of Edith Carolyn Martin. Click on the "link" to go to share a favorite memory or leave a condolence message for the family.